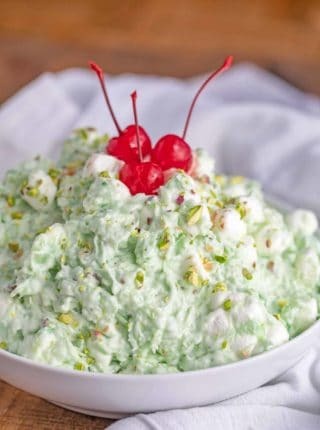 Frog Eye Salad (Acini de Pepe Salad) is a sweet and fluffy dessert salad made from eggs, pineapple, cool whip, and marshmallows, perfect for the holidays or a potluck! 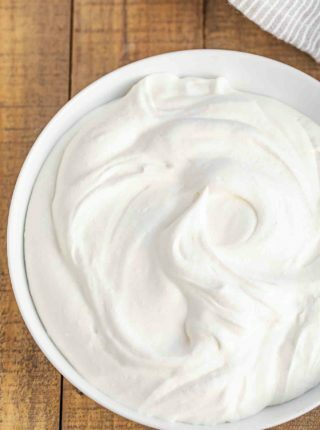 We love using real homemade ingredients in our desserts, and especially the toppings like this Easy Whipped Cream, Homemade Cool Whip, and Chocolate Ganache! Frog Eye Salad (Acini de Pepe Salad) is the perfect fruity salad to bring to a potluck, made from Acini de Pepe pasta which is similar in texture to tapioca once it’s in this salad. 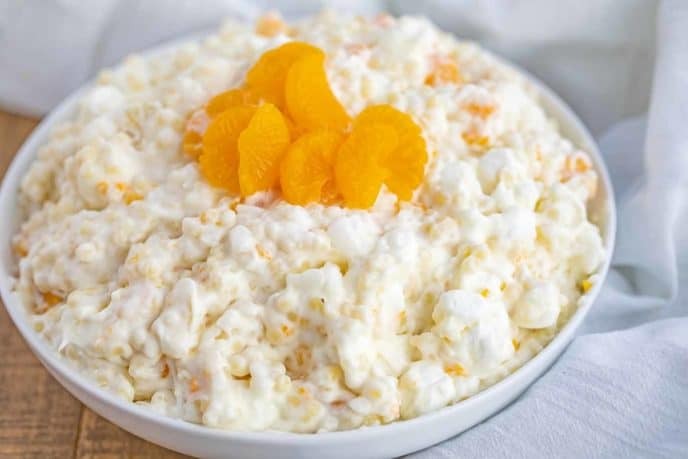 This is also a lot like a fruit salad or ambrosia salad, but with pasta and a creamy custard topping mixed in. I like to throw this together for get-togethers or holidays because it’s always a hit! Frog Eye Salad should be covered in an airtight container and stored in the refrigerator for 1-2 days. Stir before serving. If it separates or water forms on the top mix it well together again. WHAT ELSE CAN YOU GARNISH FROG EYE SALAD WITH? CAN I FREEZE FROG EYE SALAD? Freeze frog eye salad for 2-3 months, but keep in mind that this is dairy-based so the texture might be less creamy and you might find that it’s separating slightly. It is best to serve this salad fresh. Add other fruits to your frog eye salad, like banana, coconut, or strawberries. Any tiny pasta will work well in this fruit salad, if you can’t find the acini including tiny alphabet pasta or even couscous. In a large bowl, mix custard together with spices to add flavor, like cinnamon or nutmeg. Frog Eye salad may develop some water on the top when in the refrigerator, just mix the salad back together before serving. You can use fresh or crushed pineapple for this recipe. If you’re using fresh, pulse it in the food processor a few times to get the texture of the store-bought version. Personally, I prefer the pineapple packed in water or pineapple juice, as the syrup ends up with too much sweetness. This recipe is best served chilled, so I recommend not skipping the refrigeration step in the recipe. 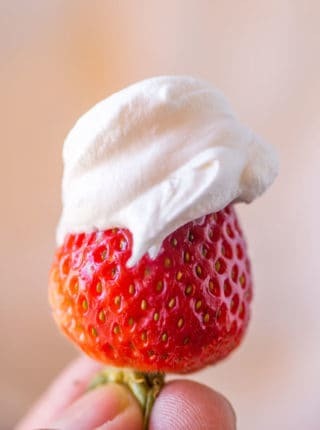 Make this recipe using my homemade cool whip, or if you’re going to serve it right away my easy whipped cream! If you’re really motivated, you can try using my homemade marshmallows. Thicken your frog eye salad with a small amount of cream cheese, or extra cool whip, although the pasta should do a good job of thickening this salad. If you don’t have mandarin oranges, you can substitute with cut up pieces of regular orange. 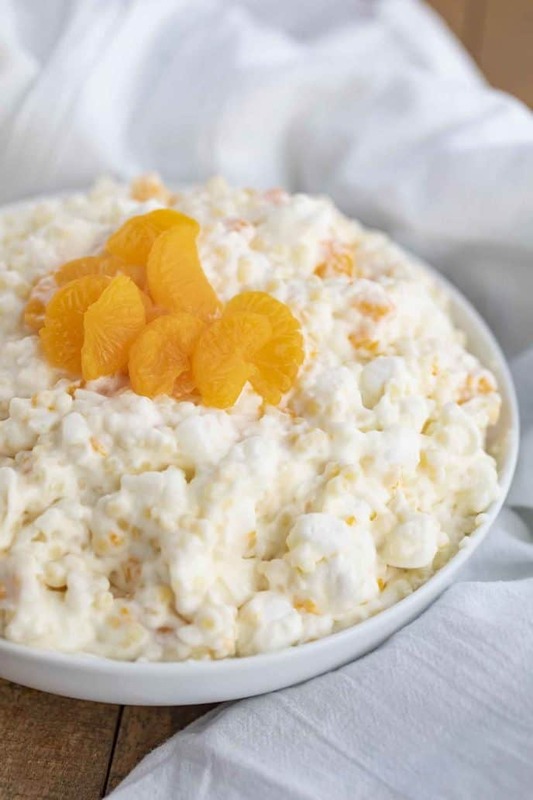 But try to get mandarin oranges if you can find them, as they add a unique flavor to the dish. In a large pot whisk together the sugar, flour, salt, pineapple juice and eggs on medium heat until thickened then turn off the heat and whisk in the lemon juice. Cook the acini de pepe pasta one minute shy of the directions then drain and rinse well before adding to the pineapple egg mixture and mixing it together. 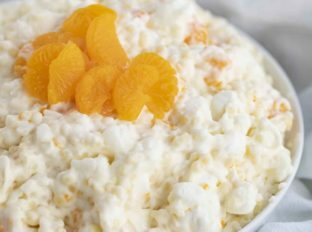 Refrigerate the pasta mixture until fully chilled and just before serving mix with the oranges, pineapple, cool whip and marshmallows. this is totally something that my girls would love! Looks so delish! 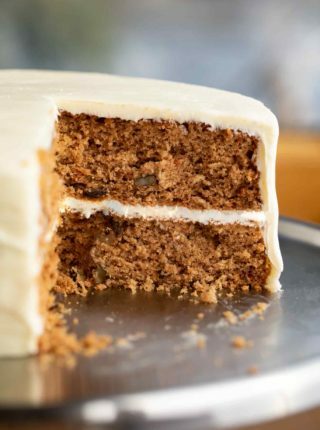 Those combinations of flavors are amazing that makes this simply irresistible, just perfect for the holidays! What a great idea of potluck salad! I am sure it will be a HIT! Wow! This is a long-lost favorite salad!! I showed this to my husband, and he said this was one of his favorite party salads, but neither one of us has seen this in so many years! Thank you for posting this! You’re welcome, Chrissie! So glad you found the recipe. I love this salad, I didn’t know it was called frog eye salad but I love it!!! This is a must have at our summer BBQs. It’s so good and everyone loves it! So glad everyone loves it! That’s so sweet of you to say, Jen! Thanks! So many retro white trash recipes. Thx for sharing!